Improve go-to-market speed and product release frequency by adopting proven best practices from leading companies. Like a ticking timebomb, developing a digital product is a race against time. The longer you take, the more competing products hit the market. You risk needing to start from ground zero because the digital landscape changes—which can blow up your budget and tax your team. DevOps is more than a process—it’s a mindset that eliminates walls between development and operations so that software can be built, tested, and deployed fast—without involving manual steps. Successful DevOps is invisible. Once established, the automation process becomes part of your culture. Instead of operating in silos, teams work as a single entity—all sharing the responsibility for the final product. The approach to DevOps is unique and customized based on what will work best for your organization. 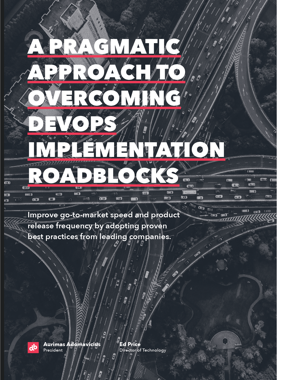 This white paper will provide a roadmap showing how to overcome the biggest implementation roadblocks and put DevOps best practices to work.